Bachelor VS Cupidon a game of the genre Action game rotate the story of the guy in the game looking to dodge the love arrows towards me! 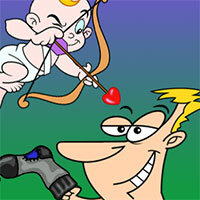 In the game you will have to move skillfully to not hit the arrows shot by the god of love, and use the available items to attack again to the gods to retreat. Let's join the game and complete the mission this time! Game Bachelor VS Cupidon played 14 times.